The origins of soap making root from Ancient Greece. In the Lesbos island, Greeks sacrificed animals to honor the gods. They incinerated the animals and took the ashes, later on, to mix with the rest of the dead animals. According to literature, once it rained hard, a yellow residue from the ashes will roll down the hill and to the river. The women shared that clothes became a lot cleaner when this yellow residue was present in the river. Sappho, an ancient poet, wrote about the same yellow liquid in her works. To honor her, the term saponification was coined. The term came from her name and is now the word used to describe soap creation. Over time, the mixture was proved to have salt water in it. Glycerin and excess water were removed, making the residue harder. This was known as the yellow soap, used for bathing, washing clothes and dishes. The olive tree was a symbol of sacredness long ago. It was found all over Greece because of the sunny weather. Greeks soon moved to utilize olive oil in soap making because it was very abundant in their country. Soon, pure olive oil soap came to be. In fact, it became so common that every Greek home created its own olive oil soap. Soap became the most essential product for daily life. Through the centuries, the significance of soap rose. Greeks used olive oil for personal hygiene, and not just in the form of soap. Olive oil was smeared in the body for various health benefits. Check out the most beloved Greek brands that have gotten beloved all over the world. Papoutsanis is a Greek brand that is known worldwide. They focus on building fresh ideas while remaining loyal to Greek tradition and heritage, leading to state-of-the-art products that were exportable. They have been crafting soap for 200 years – and the experience shows. They carry personal care products, but their authentic soap is probably the most popular one. The Papoutsanis Pure Greek Olive Oil Soap is made of pure, raw materials that came from the Mediterranean. This is a pure soap that is made using old soap making traditions, and you are assured that it lasts longer. Κorres was founded in 1996 in Athens, Greece. Georgios Korres was a pharmacist from Naxos. The brand is a producer of men and women’s beauty products, all made from pure and natural ingredients. During the time, Korres was a leader in the Greek market for pure, natural products. The KORRES Black Pine Detoxifying Mineral Bar is a face cleanser that can soften the skin, thanks to the nutrient-filled sea mud and antioxidant-rich black pine extract. These ingredients revitalize and refine skin texture. APIVITA is another Greek company that’s getting known all over the world. It follows a strong core philosophy. The brand values social responsibility and true heritage while remaining true to innovation. The company is built with people who all aim to create products that carry these values. They keep on working on new and existing products to give the market the very best possible. They have more than 300 products for the body, face, and hair today. All of these are holistic and 100% natural and safe. They are made with Greek herb extracts, pure essential oils, and beekeeping products with very high nutritional value. The company shares a “way of life” with their employees all over the world, with beekeepers and cultivators, pharmacists and researchers, and of course their customers. You can find Apivita stores and products in 15 different countries today: Spain, Hong Kong, Japan, the USA, Ukraine, Cyprus, Belgium, Romania, the Netherlands, Bulgaria, and more. 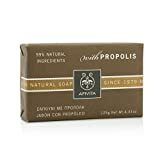 Here is a great product, the Apivita Natural Soap With Propolis, a cleansing soap bat for the face and body. It is made of pure ingredients – organic thyme essential oil and propolis, which contain antiseptic properties that help cleanse pores and regulate excess oil in the skin. 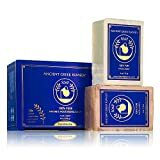 Ancient Greek Remedy is a line of products from the company Bliss of Greece. Their products don’t have alcohol, soy, artificial fragrance, or sulfate. They let the soaps dry completely for 90 days so that all the sodium hydroxide has evaporated. Olive Oil – rich in vitamins that help moisturize the skin. This is great for winter months. Use it for the entire body. It also reduces dark spots in the face. It’s great for dry and flaky skin. Lavender Oil – this has been used for years in aromatherapy and proved effective for disinfecting skin. It can be used topically, too, to treat rosacea, eczema, hives, itchy skin, skin irritation, psoriasis, atopic and seborrheic dermatitis, wounds, bacterial growth, and overall unhealthy skin. It has antibacterial and antiseptic properties. Coconut Oil – this is a great skin cleanser that also provides moisture. It removes dirt and impurities from the skin. It also is a good anti-inflammatory and moisturizer for sensitive skin. Castor Oil – in the past, they called this the “miracle oil”. It is often used to detoxify the skin by removing dead skin cells and excess oil. It moisturizes the skin and cleans the pores. As such, it’s great for back acne, pimple, cracked feet, and minor skin discoloration. Their Ancient Greek Remedy 100% Pure Nature’s Moisturizing Soap is a great product that contains these four magic oils. No preservatives, no additives, and no chemicals are used in making this soap. This can be used by everyone: men, women, kids. All skin types can benefit from it, too. Are you looking for more country-centric soap origin stories? Check out our stories on French soaps, Moroccan soaps, and Portuguese soaps. Learn more about the best brands across the globe – where they started, what makes them unique, and why they are so beloved!